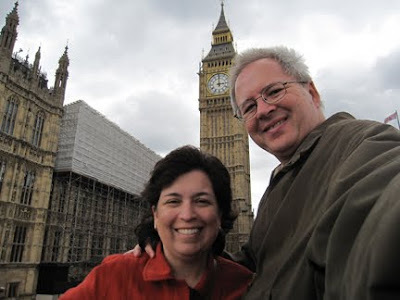 A brief report and a few photos (just a few, believe me--we took a few hundred) from our trip to London. 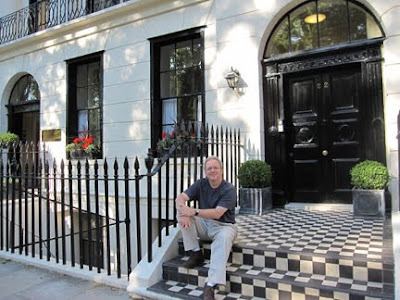 We arrived Wednesday afternoon, with plenty of time to take the Tube from Heathrow into London, find our lodging, check in, and make it to a dinner for conference delegates arranged by the event's organizer, Dr. Ian Williams. The 10-hour flight was terrible--wailing toddlers and bumpy all the way, I don't think the seat belt sign was turned off once--so you can imagine how sharp and fresh we felt joining the gang for dinner at Mildreds. It was still great to meet Ian and a few others I'd known only as e-mail correspondents, but by the time we returned to our hotel at 11 p.m. we were pretty exhausted. the Goodenough Club. It was. We slept in and poked around the city a bit on Thursday morning, so missed the beginning of the conference (I wasn't scheduled to speak until 2 p.m.), coming 'round a bit before noon. Supported by the Wellcome Trust and held at the University of London, the "Graphic Medicine" conference was a tremendously interesting mix of academics and comics enthusiasts, medical practitioners and ink-stained wretches like me, all interested in what happens when you mix healthcare with comics. The event was limited to 75 attendees; just guessing based on who I met, I'd estimate that about half were from the UK, one-third from the U.S. and Canada, and the rest from various elsewheres. 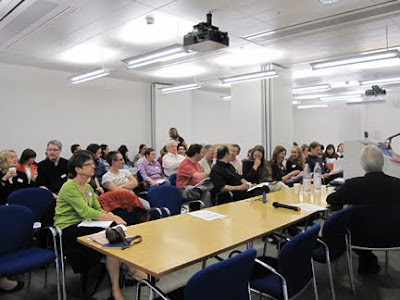 Most of the talks took place in one large classroom (really two, with the dividing wall between them open), with breakout sessions in a smaller room downstairs, and lunch and an after-conference wine reception held in a large central hall. Ian Williams, the conference's mastermind, who's both a physician and cartoonist in his own right. He and Laura were terrific people. One highlight of the conference: watching Ian go pale and shrink down in his seat as a speaker analyzed his cartooning, done under the pseudonym "Thom Ferrier." The main room filling up as Ian does housekeeping before I'm introduced. 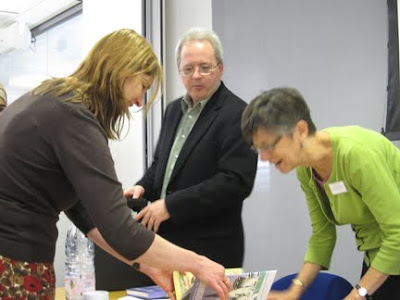 That's the back of my head at the right. Ignore the thinning spot on top; I do. Discussing WHTTWOT with Giskin Day, a Medical Humanities lecturer at Imperial College London who wrote an early and generous review of Mom's Cancer, and Susan Squier, a Penn State professor and writer who introduced me with probably the nicest remarks anyone's ever said about me, including my own mother. It was really terrific to meet them both. I think my keynote lecture went very well. I had to improvise when I realized that not everyone could read the comics in my slides due to how the room was configured, so I read them all aloud. People said nice things afterward. I spoke for about 40 minutes, took some good questions, and then sat in on a couple of other sessions before doing a panel discussion with Darryl Cunningham and the effervescent Philippa Perry that closed the day. I found Darryl's cartooning particularly interesting; in addition to his book Psychiatric Tales, based on his own experiences working in a psychiatric hospital, he's done a journalistic comic eviscerating Dr. Andrew Wakefield, the discredited quack who convinced millions that the MMR vaccine causes autism, and hopes to do future work taking apart the Moon Landing Hoaxers. I admit I wasn't familiar with his work before, but I think he'll be one of my favorites in the future. I also enjoyed getting to know Ada Palmer, whose day job is assistant professor of Renaissance history at Texas A&M but who would rather study the work of manga master Osamu Tezuka. With my pal MK Czerwiec, "Comic Nurse," who I thought gave an outstanding talk on the topic, "Could Making Comics Help Caregivers?" MK teaches a Medical Humanities course at Northwestern University, and she showed results from one exercise I found especially interesting in which she asked doctors-in-training to draw an experience from both a doctor's and patient's point of view. As doctors, their drawings were very clinical and anatomical; as patients, the drawings expressed a full range of emotions and outcomes. It was a striking and illuminating contrast. 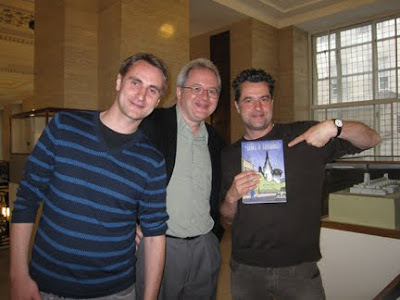 Ewen and Graham from my publisher Abrams's UK office brought a few boxes of WHTTWOT to the reception to sign and sell (a bargain at £10!). Unfortunately, they didn't have any copies of Mom's Cancer available. 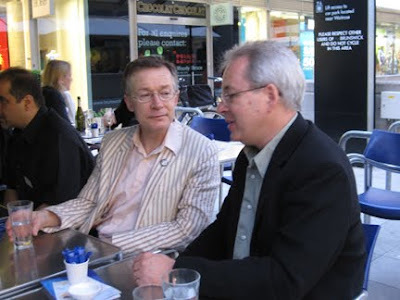 At a post-conference dinner with Paul Gravett, another keynote speaker and the dean of UK comics criticism and journalism. Imagine the most urbane, personable, charming, Britishest person you can, add Alistair Cooke, and you've got Paul Gravett. 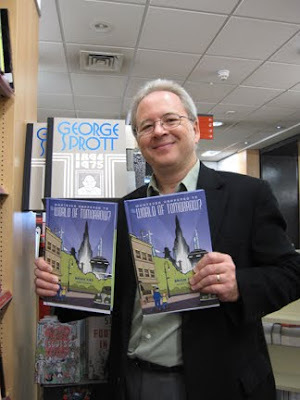 We found two copies of WHTTWOT "in the wild," at Foyle's books on Charing Cross Rd. Friday and Saturday, Karen and I got to be tourists doing the mandatory tourist things: the British Museum, Tower of London, Buckingham Palace, Trafalgar Square (one of the great public spaces in the world), Covent Garden, Parliament and Big Ben (which I know isn't the name of the clock or tower, but of the big bell inside). Even Harrod's, which was nuts. I won't bore you with stories of our blistered feet nor more than a couple of photos. 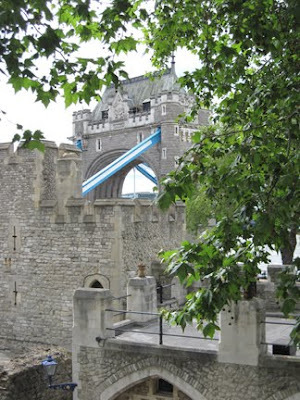 One of Karen's "artistic" shots: the famous Tower Bridge peeking over the walls of the Tower of London. We were very smart at the Tower of London: got there as soon as it opened at 9 a.m. and went directly to see the Crown Jewels. Almost no one else was there; there's a moving walkway that carries visitors past the display cases that we were welcome to circle around and repeat to our hearts' content. After that, we went back to the gate to join a free tour guided by a Beefeater. Our very entertaining Beefeater, Ray, also happened to be the Tower's ravenmaster. If you can put "Ravenmaster" on your resume', you are the coolest person I've ever met. 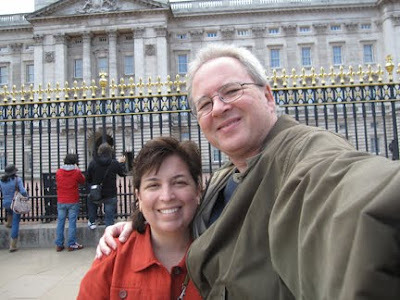 Two armslength self portraits at Buckingham Palace and Big Ben to prove I'm not lying, because I could tell you were getting suspicious. 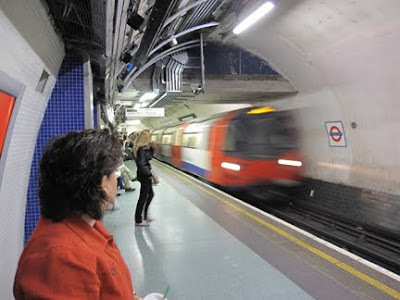 We relied on the Underground for pretty much all our transportation, but lucked into a double-decker bus tour through the center of the city when a Tube station we'd planned to use was unexpectedly closed and we had to find an equivalent land route. It turned out to be a great way to see London and probably my favorite surprise of the trip. 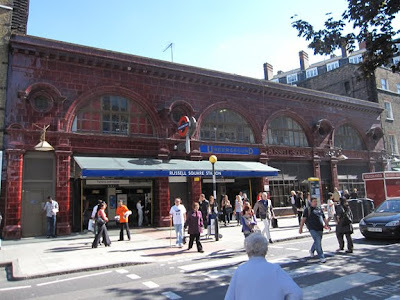 Our home base, the Russell Square Underground Station. Karen watching the train blur by. "Mind the gap." I liked everything about this Underground sign: its tile work, its design, its colors, its font. 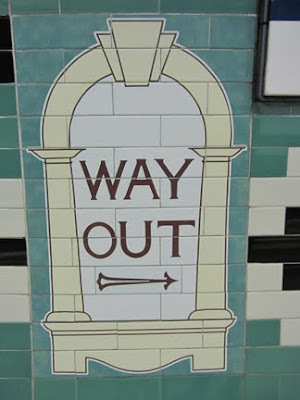 I remember watching the original British "Prisoner" series, and the "Way Out" signs that prominently figured in some episodes, when I was a teenager. In that program, they were eerie and ironic; there was no way out of the Prisoner's Village. I hadn't thought of that in decades until I saw these signs everywhere. They made the Tube just a bit spookier to me. Our double-decker. 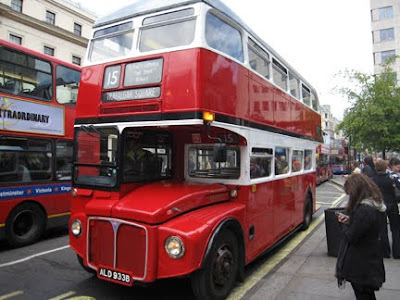 We lucked out and got a classic old Routemaster model from the 1950s, which is the same kind I drove as part of my university's transit system when I was in college. If our driver had had a heart attack and I was somehow able to dash down the spiral staircase in the back of the bus, run around to the front, pull him from the cab, and hoist myself up, I could have saved us all. 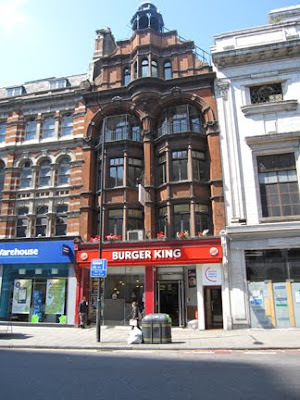 Perhaps the world's most jarring combination of form and function: a great old building blasphemed by a BK. We loved London, met some talented, smart, committed and very friendly people, and hope to see more of both the city and them in the future. It's a fun and exciting town, and even moreso when English footballers are competing for the World Cup. Many thanks to Ian for inviting me, the University of London for hosting, and the Wellcome Trust for making it possible for me to attend. I'll do it again anytime. Let's see, the thing I most envy? That you met the royal ravenmaster! Brian, many, many thanks for coming over to speak. You were totally brilliant and everyone loved you. It was great to meet you and Karen and I'm so glad you had a good time in London. I left on Saturday morning to head for a weekend on the Lleyn peninsular and guess where I visited on Sunday? Portmeirion: "The Prisoner"s village! spooky you should mention it. Sounds like a grand time. Thanks so much for all the photos and commentary and, of course, the cool reference to THE PRISONER! So this is the speech you were worried about?? 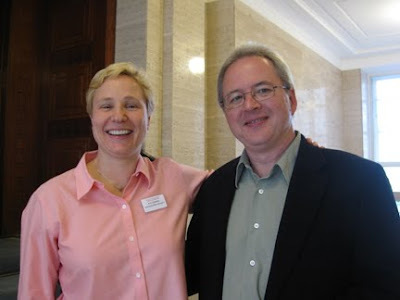 Marion, your envy is entirely appropriate, meeting the Royal Ravenmaster has indeed made me a much cooler person. Ian, you're very kind, thanks again. What an odd "Prisoner" connection; it's almost as if we're being . . . watched. Mike L., a grand time it was. You're welcome, my pleasure (believe me). Be seeing you. Eve, thanks for the blog post and link, I didn't see that the first time. I appreciate you coming by. 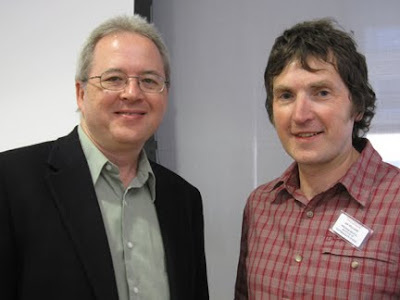 Mike, I'm pretty sure the talk went well because I fretted about it. It's when I'm cocky and complacent that I get into trouble. Excellent reporting and excellent photos. I can't believe how much of London you were able to see in one day! Thanks for sharing, I'm envious. Ronnie: Thanks! We had two full days for touristing, really, plus bits of others. The British Museum alone took us six hours (well spent) and we still didn't quite see it all. When we e-mailed our girls, who'd already been to the Museum, they replied, "Did you see the big Roman columns in the basement?" We responded: "There's a basement?!" Missed it entirely.